On Saturday, two races were scheduled for the final day of racing. A beautiful, clear blue sky greeted us that morning but not much wind. In fact, the little bit of wind that did arrive on Gull Lake swung around wildly in direction, and never amounted to more than 5 knots. The Race Committee postponed the start at the scheduled staring time of 13:00. Nothing material ever developed so at 15:00, racing was cancelled for the day. The results of the 5 races held on Thursday and Friday determined the standings in this first Vintage Gold Cup. Brian and I won the regatta, in Gem IX, the ‘64 Olympic winning boat of Sir Durward Knowles, ahead of Arthur Anosov and David Cesare and their boat Magic. Two time Olympic Gold Medalist, Mark Reynolds with Michael Brundage crewing, rounded out the top three. The Vintage Gold Cup is a celebration of the history of the Star Class which is over 106 years of age. It will be an annual event with more restored boats participating. Twelve vintage boats competed, all of them wooden and more than 50 years old and expertly restored. The event and the boats are the creation of Don Parfet and Jon Vader Molen. 10 years ago, Vader Molen created the P-Star. The P-Star was a fast design, and built with the highest technology and processes allowed in the class. At the 2012 Olympics, 15 of the 16 competitors used Vander Molen’s P-Star. About 25 were built. There is a long history of Stars on Gull Lake and in both the Parfet and Vader Molen families. Check out the Vintage Gold Cup on Facebook. There are many videos of the event there. Across the street from the Gull Lake Yacht Club is the Gull Lake Country Club. 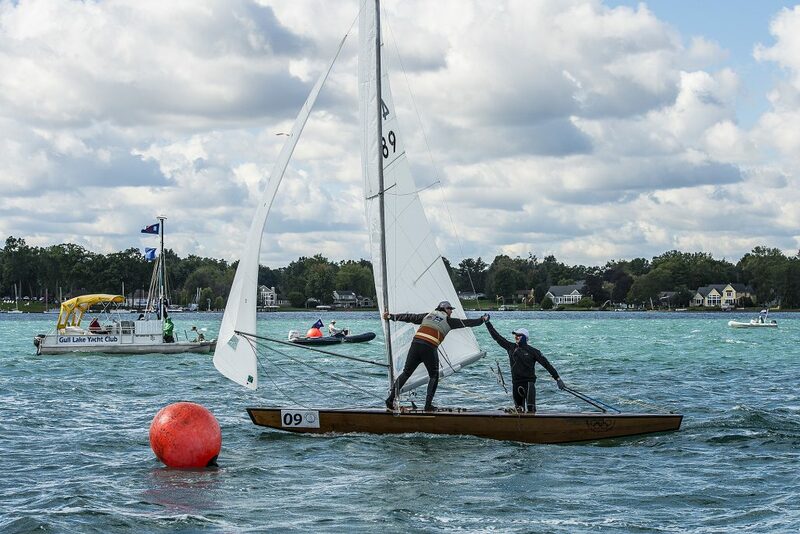 Sailing and gold go well together, but never has it been more convenient than at Gull Lake. I am told that when there is a lack of wind, the sailors play golf until they hear the cannon sound, which means the wind is in and the race will start one hour later. Thats plenty of time to launch the boats and get out the the starting line which is all of a 5 minute sail. I am off to Italy tonight to join the One Ocean Forum in Milano, October 3-4. Yacht Club Costa Smeralda has taken the leadership role in gathering a very qualified group of people from business, the marine sciences, as well as people who enjoy the sea. I am very much looking forward to the presentations, discussions and hearing about various projects to restore our oceans to the pristine state they were a relatively short time ago. The Oceans not only provide us a great field to enjoy our sport but they are, along with oxygen, our most important natural resource. Visit www.OneOceanForum.com or follow @oneoceanforum on Twitter and Facebook.